During the summer it's the call of the beach, and in the winter you're beckoned by the mountains. Regardless of the time of year, something will lure you away from the pavement you should be pounding. There's not much you can do about the past, but you have control over your future. It's time to get serious and get your job search back into full gear. When you decided to seek other employment opportunities, were you reacting to job burnout? Is the boss who was making your life miserable now gone? Vacations and changes in management can have a huge impact on how you feel about your job. If you've had a chance to recharge your battery, or if your new supervisor is providing you with an enjoyable work environment, then perhaps you should sit tight. Your situation has changed for the better. If things really haven't changed much, then it's time to reenergize your job search. Looking for a job is a full-time job itself. If you are employed while job-hunting, you are working the equivalent of two jobs. No wonder it's easy to get overwhelmed. To really pull it off, you need to be organized. That's why it's important to establish a plan and then work the plan. Set goals with appropriate deadlines for yourself at the beginning of each week. Monitor your performance throughout the week to ensure you are staying with the plan. You may have already contacted everyone on your networking list, but it's time to do it again. Call your contacts and find out how they're doing. Gently remind them that you are still seeking a new opportunity. Don't forget to ask if they know of anyone else with whom you might speak regarding your search. Thank them for their time, and let them know that you will check in with them periodically. Many people think that once they have registered with a headhunter, their work is done. Actually, your work has just started. You should be in touch with your recruiters at least once every two weeks just to remind them you are still out there. If you happen to follow-up with them right after they've received a job order, you might be the first one on their list to be sent out for the interview. Top of mind is very important when there are lots of qualified candidates on the market. Join your local professional association and start attending meetings and events. Get involved in the organization. Join a committee. 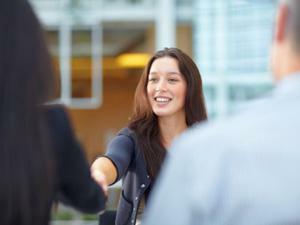 The more involved you become, the more likely you are to meet people who might be able to help you in your job search. To find a local professional association, go to the national organization's Web site. You might also try contacting some colleagues in your area to see which groups they belong to. Build your Monster resume now.